Location: Moderate level of fitness is required. I really recommend River Explorers if you are looking for an unforgettable experience with nice guides, amazing nature, plenty of adrenaline and lots, lots of fun. High in the impressive Andean mountains from Cusco, countless rapids from level II to V with nice standing waves, drops, endless in scenic wonders, the Apurimac River rafting trip begins. By the time its odyssey ends in the Amazon Jungle, this river has become the source of the world’s largest river: the mighty Amazon. Escape entirely on a worry-free holiday with no schedules and no stress, where time stands still. Briefing (night before trip departure): pre-departure information: description of river canyon, navigation, what to bring, etc. Your tour leader and our private van will meet you at your hotel at 8 am for the four-hour bus journey to the Apurimac River. On the way, we will have one stop at Izcucahaca to buy the last supplies for the trip. We will stop several more times along the way to stretch our arms and legs, enjoy the view or go to the bathroom. Before the rafting begins, we will stop for the final time at Condorhuachana (place where the Condor stands), an amazing gazebo on the Apurimac Gorge from more than 2,000 meters (6,561 ft), a perfect place to enjoy the views and take pictures. At the river, the whole crew including passengers will help organizing the rafting expedition. You’ll then pack your camping clothes, sleeping bags etc., into the dry bags (special water prove bags provided by us). Once the expedition is ready, there will be a fresh lunch near to the riverside. After lunch, the head guide of the expedition will go over the rafting commands demonstrating different techniques of how to sit on the boat, how to paddle, rescue systems, secure lines etc. After an informative safety briefing, you’re off to the river for a training session where we will have fun practicing how to hold onto the rope securely, grabbing the safety kayak or cataract, learn swimming in some rapids and practicing flipping the rafts over. Once the head guide, guides, safety kayak and crew feel confident, we will start rafting the Apurimac river. The first half an hour will be fun class II and III rapids and peaceful calm sections in between astonishing vistas of the Apurimac river gorge. After the initial section of the river, we will arrive to a series of level III and III+ rapid (Some of them level IV in May and beginning of June)l. More rapids and amazing vistas will be seen downriver before reaching camp later in the afternoon. Once at the camp, your guides will give a brief orientation to become acquainted with the area, the camp routine and our solid waste toilet system, then you can relax, read a book, enjoy an afternoon snack or have a glass of wine as the guides make a delicious dinner. After dinner, we will gather around the camp fire where your river guides will give a briefing about next day and then we can enjoy the tales and experiences of your river guides or just lying on the sandy beach watching the spectacular starry sky. The day begins at 7:30 am with a delicious breakfast including, cereal, fresh fruit salad, coffee, yogurt, bread, juice, tea, oat meal etc. After breakfast, it’s time to pack up the dry bags, tents, and reload the rafts for the day’s rafting adventure. At 9 am, we jump into the rafts and continue rafting through the canyon wilderness. Just around the corner from camp, we have many level II, III and III+ technical rapids until we arrive to El Chute level IV. Afterwards, you can enjoy the amazing scenery of the river gorge as you paddle toward the Portage rapid. The Portage is a level VI rapid where passengers need to walk around this section carrying dry bags while the guides take the rest. Thereafter, we arrive at Minefield canyon with a series of level II, III and IV rapids until the river calms and go into the Purgatory Gorge. This is a fantastic place where we can see different rock formations that the river and other natural agents built over the years, this are perfect places to jump from a cliffs or swim in the calm water that purgatory provides. Soon after this we arrive at the Purgatory rapid level IV. The whole river flows into the left-hand side of the canyon near a massive wall, creating big waves and powerful currents making this one of the best rapids of the Apurimac river. We will have one more portage after purgatory. Continuing on with our adventure, the river meets another affluent called Vilcabamaba a perfect place for lunch, take a short walk and explore the unique geology of the Canyon or cool off swimming in the river while your guides will making another fantastic meal. After lunch, there will be more rapids to come such as Las Tres Marias and The Z – all level IV rapids. Before reaching te second camp, we will collect wood for the campfire. Once we arrive at our riverside campsite, we can change into camp clothes and set up tents. Guides will assist with setting up your camp, and then you will be free to read a book, hike, or enjoy a refreshing swim on the river. After relaxing for a few hours, the Guides will have a hot delicious dinner ready for you. After dinner you can relax with a cup of coffee or tea next to the campfire under the stars playing cards, telling more river stories, and re-living your best adventures moments from the Apurimac river rafting day. After a good breakfast, we will start running the Indiana Jones, The Roller Over and Window rapids– all class IV with nice waves and holes. Among these rapids there are many other rapids level II and III. Finally, one of the biggest rapid of the river is about to come, El Trinche, level IV (level V from may to June). This place offers outstanding rapids including massive waves and holes. before running this rapids the guides will organize the safety, once this is ready the passenger boat will run the rapids. 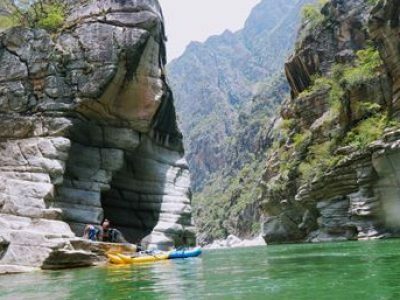 The adventure still continues with more rapids and extraordinary vistas of the river canyon. The Table beach will be the next stop to enjoy another lunch. After lunch, the river starts out with exciting rapids, so be prepared for a thrill from the beginning. During the first hour, we will raft through a close gorge full of technical rapids such as Wake Up, Ramona, and the Labyrinth, all level IV, and minutes after, we will be in the biggest rapid of the Apurimac River – the Toothache. Passengers will bypass the rapid on land. Only the river guides will be able to run this rapid. Immediately after this rapid, we will go through the final portage and a section of level II and III rapids until we arrive at the last camp. At camp, and for last time we set the camp up, rest and enjoy the last dinner together on this magnificent setting. Immediately after breakfast we will have the biggest great V rapid on the Apurimac River – Babaluba. The safety kayak will run the rapid first, the luggage boat after and once the safety kayak and the rafting guides with the rescue lines are properly located, the passengers’ boat will start running the rapid. We enter to the initial section of the rapid through small channels with many rocks, the river then calms, and like a roller coaster we disappear dramatically while the boat is jumping through drops and holes, there is only few seconds before we enter the next rapid, and again we disappear into the waters of this great level V rapid. After this section, there will be a series of class II, III, and III+ rapids to run until the end. Our private bus will be waiting for us with a good lunch and cold drinks and the end; thereafter, we board the bus for a two hours ride to Cusco. In Cusco, we can enjoy watching a video of the rafting adventure on a big screen in one of the local pubs. Guides: Professional English-speaking river guides, certified in Swift-water and Wilderness First Responder. Rafting gear: Hi-flotation life jackets level V, State-of-the-art rafting equipment including, self-bailing rafts, helmets, dry bags for personal gear, paddle jackets, wet-suits and special containers for cameras. Safety and professional river system navigation, tents, , private round trip transportation, video and picture service. Full first aid kit, including disposable resuscitator (CPR Bag Valve Mask). Inflatable mattress (may rent for $10 per trip), sleeping bag (may rent for $15 per trip). Clothing: Shorts (obligatory in order to wear over wet-suit), lightweight long trousers (for evening), fleece/thermal top, T-shirts, sandals that covers the whole foot, bathing suit. River Explorers work every day in an effort to prevent pollution and contamination in the Apurimac River. To keep this section of the river clean, we have garbage disposals for organic, inorganic and human waste. We have a variety of wild life inside the canyon that you will be able to see during the tour. Fauna: River otter, fox, deer, condor, variety of birds and — if you’re really lucky –puma! Garbage disposal: all inorganic matter is returned to Cusco, including human waste (transported by means of cargo boat). At the links below are some rafting tips that will help you to choose the right outfitter for your adventure tour. These tips will make your Apurimac river experience more enjoyable and will keep you safe. The Apurimac river is open only during dry season (May to November). enter the River before or after this time is highly dangerous for commercial rafting. Our departures are flexible. Our minimum number of people to run a trip are two and maximum 12. Our departures are 100 % guarantee with the minimum of two people.